We get that solutions don’t just grow out of whiteboards. To solve your most complex organizational challenges, you need people who will take the time to listen and get to know your specific needs. You need people who can bring together the expertise, products and services to build the solutions you need to succeed. 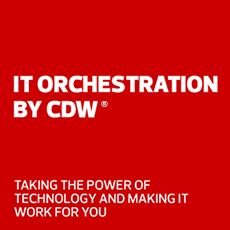 You need IT Orchestration by CDW™. Join host Nacho Vega as he hits the road with the CDW Technoliner to discover technology in action and meet unsung IT heroes. Watch how VNTANA is using technology like holograms and augmented reality to entertain and engage sports fans. How Can You Support Changing Workloads? See how cloud infrastructure can help you store, transport and process the data created by an IoT initiative. Check out how organizations are utilizing IoT and the top benefits and risks according to IT professionals worldwide. How Can You Protect Your Data and Your Organization? Learn about the risks unsecured IoT devices can bring and see how to prevent beacons and sensors from becoming backdoors for hackers. Check out this webinar to see how healthcare organizations can make disaster recovery plans that allow uptime even in a worst-case scenario. How Can You Keep Workers Connected and Productive? From improving security to decreasing costs, see how a software asset management solution can help you streamline SaaS management. Learn the three factors of effective collaboration and how they can help you connect your workers in and out of the office. How Can Technology Help You Work Smarter? Learn how HCI solutions are helping healthcare organizations save time and money by speeding up processes and managing expansions. See how you can create immersive classroom experiences with help from augmented reality. See what’s trending in tech and read success stories. Dell Systems creates the ideal mobile strategy for your orgnaization, keeping your people on the move and the data that’s moving with them totally secure. Amazing customer experiences are powered by modern devices. Modern devices are powered by Intel®. Lenovo’s emphasis on purposeful design, trusted reliability and continuous innovation creates products that help professionals stay productive, prepared and connected, no matter where their work takes them. The Surface portfolio enables natural and personal interactions that engage the senses via touch, voice, gesture and the Surface Pen. HPE Aruba provides the scale and flexibility for the most demanding data centers, and the everchanging digital workplace. Employees are working differently today and with a Xerox VersaLink printer solution, organizations can transform their workplace and allow their employees to discover greater productivity. HP notebooks and tablets are the choice for those who value a flawless experience. Samsung knows how to deliver an eye-catching display, whether your organization seeks desktop, large format, video-walls or signage. NEC offers desktops and large-screen displays that results in technology-rich deployment designed for your unique needs. Dell Federal Systems brings you the latest secure technology, from mobile devices to desktops, and provides the right mobile strategy that works for your agency. With VMware vSan software, IT decision makers can modernize and virtualize their network, enabling greater organizational efficiency. Intel is transforming the data center with amazing new technologies to enable secure, wireless collaboration, helping everyone experience a better way to work. Ergotron has a growing portfolio of mounting and mobility products for computer systems, displays, laptops, TVs, tablets and mobile devices. NetApp provides software, systems, and services to manage, store, and extract value your data. LG offers innovative digital products with a comprehensive line of award-winning displays. With “invisible’ hyper converged infrastructure from Nutanix, organizations can converge compute, storage, virtualization, and networking and simplify the way they work. Secure HP Printers like HP LaserJet & PageWide Enterprise Printers will help defend your network. APC allows organizations to protect their customer experience with reliable APC Localized "Edge" Micro Data Centers. Whether you’re managing a large or small fleet of Mac systems, our new book can help you efficiently integrate and scale OS X across your organization. Skype for Business is part of the Microsoft Office 365 productivity suite, giving you the power of voice, video, chat and content sharing from anywhere at any time. Dell Federal Systems accelerates the journey to cloud computing, helping agencies store, manage, protect and analyze their most most valuable information.